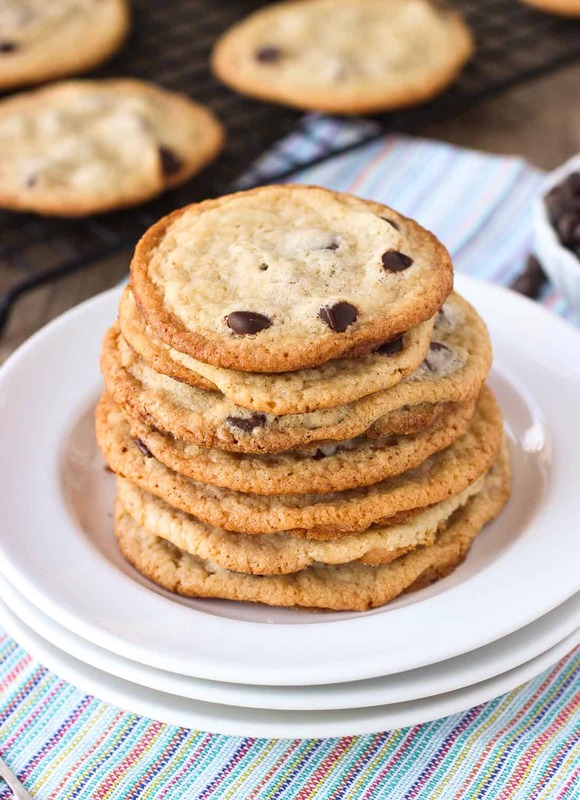 These easy chocolate chip cookies with Bisquick are thin, chewy, and delicious. 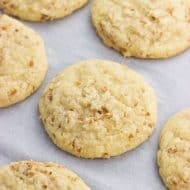 They resemble cookies made with flour, stay chewy for days, and aren’t cake-y or crisp. 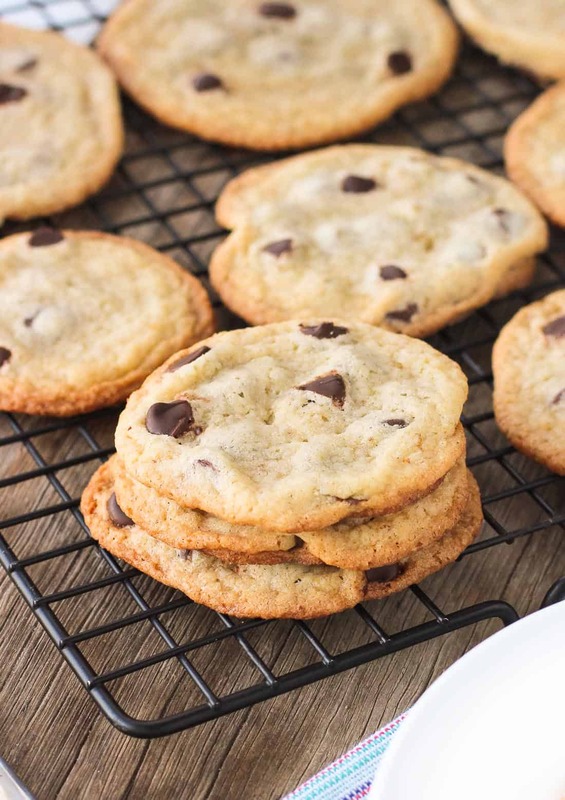 A great cookie recipe to have on hand for when you run out of flour and the chocolate chip cookie craving strikes (or, anytime)! I like to think of myself as someone who plans. 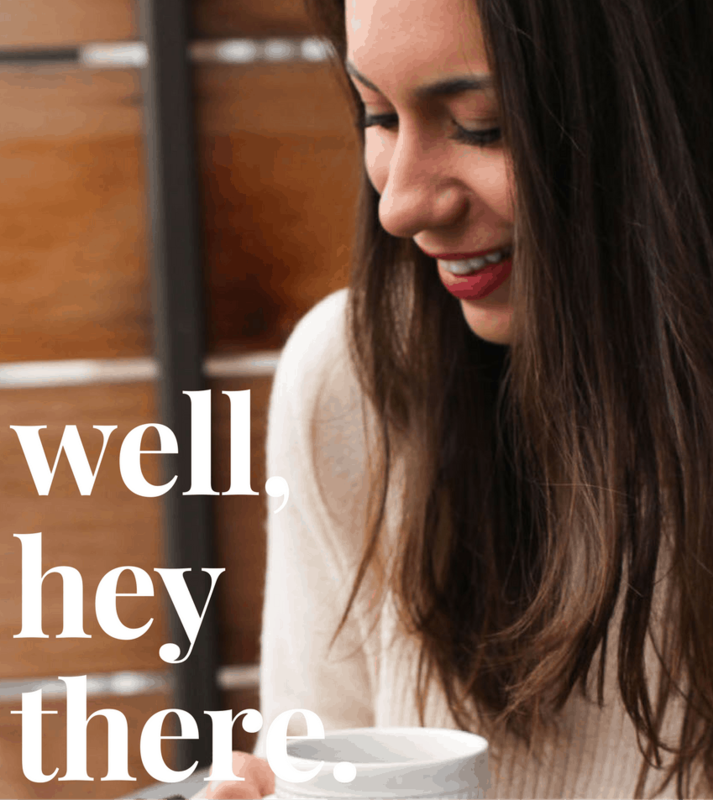 I like planning: making lists, talking about making lists, crossing things off of lists…all of it. So when Nashville was in the path of the beginning stages of Winter Storm Jonas, I was on it. We gathered bread, coffee beans, toilet paper, a box of wine (essential, obviously), flashlight batteries (thankfully not needed), etc. Bring it on, Jonas! We were set. Set until a chocolate chip cookie craving set in, and when reaching into the cabinet to grab the flour I found that we had RUN OUT and hadn’t restocked. Haaaaalp! Going to the store wasn’t an option given the snow storm, so despite a quick Google search saying Bisquick would not be a good substitute in a cookie recipe, I was desperate and gave it a shot. 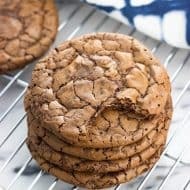 While these won’t be winning any awards for the thickest cookies ever, these thin and chewy chocolate chip cookies with Bisquick t-o-t-a-l-l-y hit the spot. 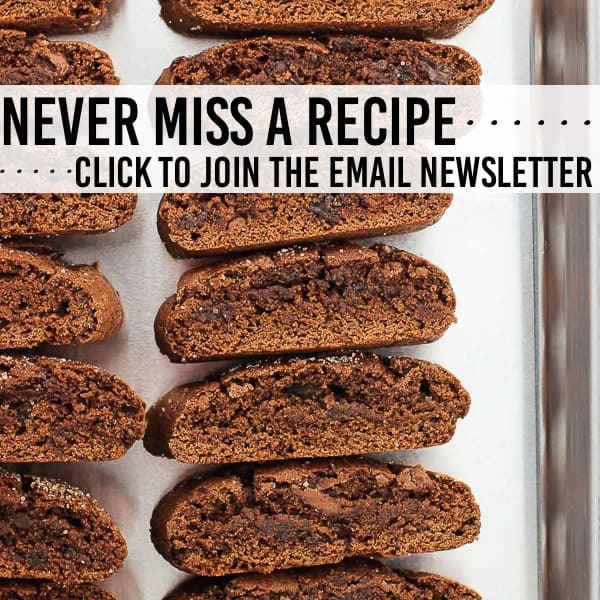 Lots of chocolate surrounded by a buttery, chewy cookie. What’s not to like? All this is not to say the whole thing was easy breezy. I somehow cut my finger while washing my cookie scoop, and then squeezed it with the strength of the Hulk and broke it, shooting cookie dough into my eye in the process. But chocolate chip cookie cravings are resilient, so I grabbed a disposable plastic glove to cover my bandaged finger and eyeballed equal-sized cookie dough balls to make it happen. Bisquick is a staple in my kitchen. 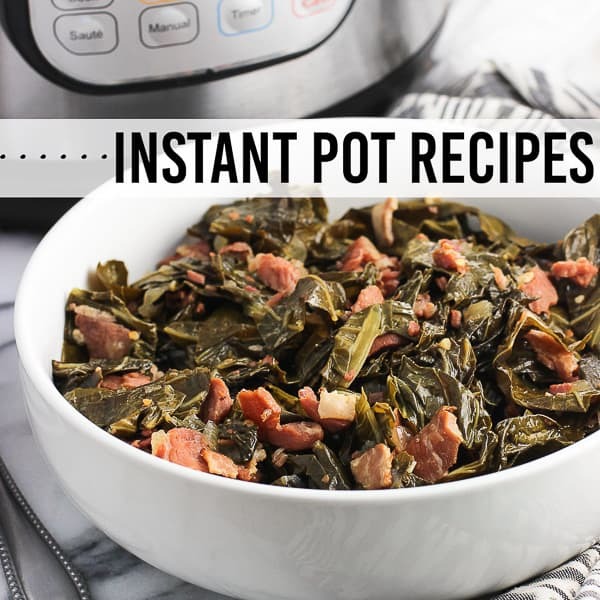 I love using it in healthy, crustless quiche recipes and for super quick drop biscuits when dinner will be ready in ten minutes and we still need a side dish. But it’s not the same as flour. Bisquick is mostly flour, but also contains a bit of shortening, salt, and leavening ingredients. That’s why you can mix Bisquick with water or milk and end up with a fluffed up, raised drop biscuit. 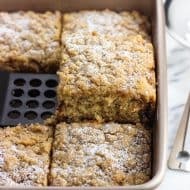 Try that with flour and you’re sure to end up scraping hardened sludge off of your baking sheet. 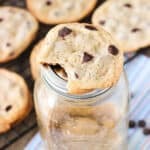 These chocolate chip cookies are a mash-up of my favorite chocolate chip cookie recipe and a new-fangled Bisquick version, simply because I started out mixing the wet ingredients together thinking I had flour, but realized all I had was Bisquick only when it was time to add in the dry ingredients. One of the changes I made was I omitted the baking powder I was planning to add, because Bisquick already has a leavening agent included. Easy enough! Then I baked a test batch of a few cookies to see how they would handle baking. 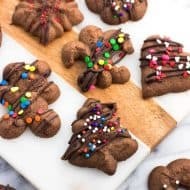 At first the six cookies looked like melting snowmen in the oven – a mostly-round ball with a “puddle” of dough around it. Soon enough the rest of the cookie followed suit and flattened out (whew!). Then the cookies puffed up and started to resemble pancakes, at which point I got nervous. I do love pancakes but when a cookie craving hits, a pancake will not do. Once the edges browned I removed the baking sheet from the oven and was happy to see the kinda puffy cookies deflated as they cooled, becoming more dense and chewy as time went on. Because these cookies spread pretty significantly as they bake, I chilled the next batch for about an hour before rolling them into a ball and baking them to see how they’d handle. Maybe this batch spread a little bit less than the first one, but the result didn’t have a major change that I’d say required chilling. You can chill if you’d like to prepare the dough in advance of wanting to devour freshly-baked cookies, but I don’t think it’s necessary otherwise. Preheat oven to 325 degrees F. In a bowl, mix together butter, sugars, egg, and vanilla extract on medium-high speed until light and creamy. Mix in Bisquick until it's fully incorporated, taking care not to overmix. Scoop cookies using a 1- or 1 1/2-tbsp cookie scoop and place on an ungreased non-stick baking sheet, leaving plenty of room between cookies as they spread. You can also form evenly-sized balls with your hands. I'd suggest leaving at least 3" between cookies to give them ample room to spread. Bake for 11-12 minutes, or until cookies have slightly browned around the edges and tops have mostly firmed up. Remove baking sheet from oven and let the cookies cool on the sheet until they've cooled almost completely. They will become more dense and firm up some as they cool. Store in an airtight container. Hi Alyssa I made these cookies using gluten free bisquick. They were terrific. They were not as thin but flavorful and delicious! 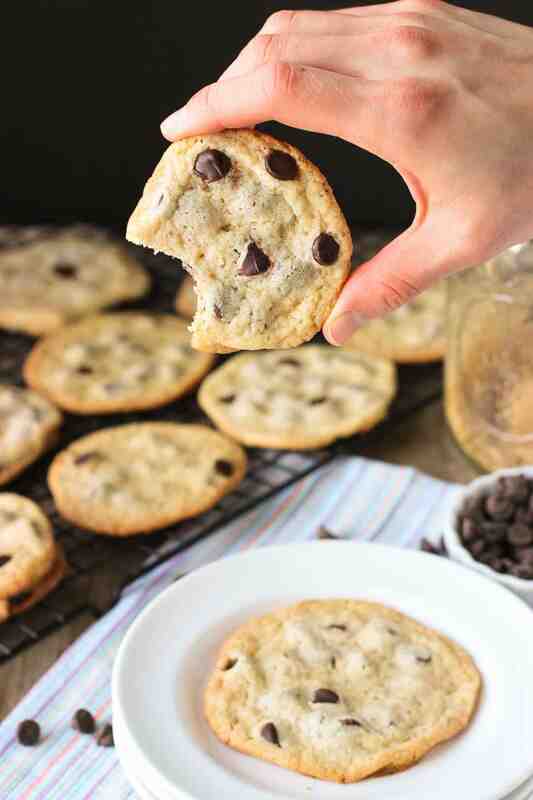 I will certainly make these whenever I crave chocolate chip cookies and need a quick recipe. Thanks for sharing. 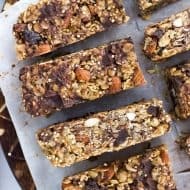 I totally want to try these! I love that you had to get creative for that cookie craving…you can’t ignore those things, right? Oh my goodness, Alyssa! What a fiasco! Sounds like something that would happen to me! (even though I always plan ahead, too!) Glad you were able to satisfy your chocolate chip cookie craving – cause those can be intense!! I’ve never heard of Bisquick (Google helped me out with that one, so all good now! ), being in Australia myself, but whatever it may be, it looks like it makes darn good choc chip cookies! YUM! Aha yes, I suppose Bisquick is one of those regional things. 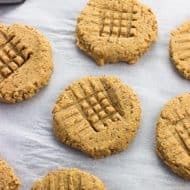 I’ve used it mainly for breakfast foods but had never thought to try it in cookies. Evidently it works! Thank you Lisa! Oh no, hope your finger is okay, Alyssa! 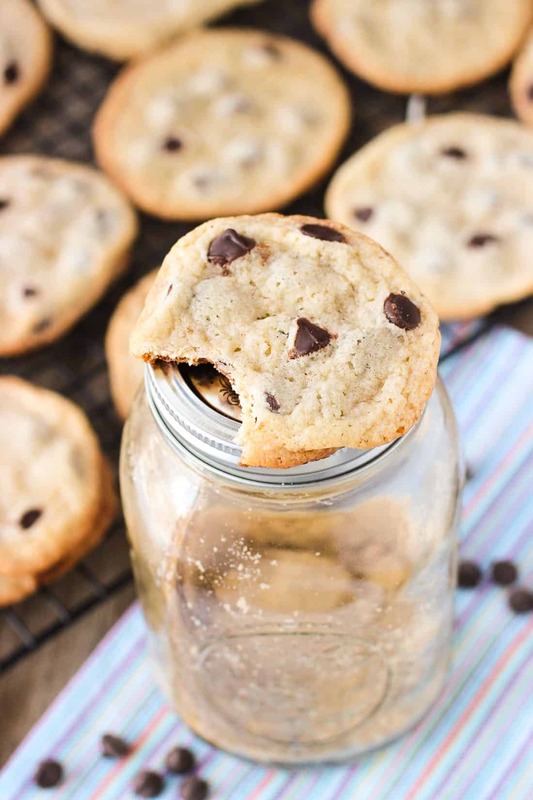 These cookies look delicious -totally worth the broken cookie scoop! Love that you used Bisquik, chewy cookies are my favorite! Oh no! Running out of flour is the worst! Though truly, not as bad as running out of wine during a blizzard would have been. 😛 This is such a great solution! 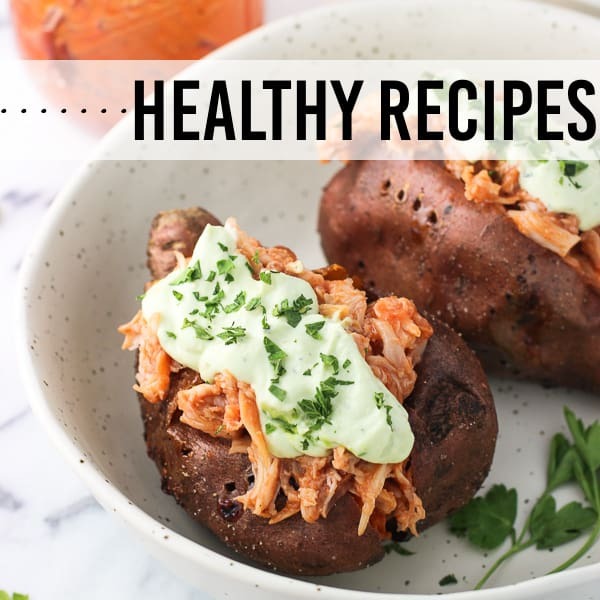 They look super yummy and perfect for cozying up in a snow storm! Hahaha I know! TN still doesn’t allow wine/liquor sales on Sundays, and laws juuuust passed to allow wine to be sold in grocery stores (so skirting by the Sunday thing), but ours haven’t been stocked yet. We always need to plan ahead when it comes to wine! I was so bummed when I realized I forgot to buy flour but so glad it all worked out. Thanks Jess! Hey Consuelo! It was a lot more snow than Nashville has gotten in a long while, but that was fine by me – it meant I got a day off of work. 🙂 Chewy cookies are a favorite of mine, too. Thanks girl! A cookie MUST be chewy and soft! Thin or thick is fine, but chewy…the key! I’ve never thought to use bisquick in cookies before! So creative! I love that these cookies are chewy, the best kind, in my opinion! 🙂 Sounds like you were all set when the storm hit! I always thought Bisquick would make a cookie that’s cake-y and puffy like pancakes, but was so pleasantly surprised these had the consistency of regular chocolate chip cookies! The two of us definitely did some damage to this batch over the snow storm haha Thanks Gayle!